Welcome! To start things off, could you please each briefly introduce yourself and talk a bit about your vision for Sword and Sonnet. Rachael: I’m Rachael K. Jones, former editor of PodCastle, award-nominated author, professional Tyrannosaur, Nicolas Cage enthusiast, and secret android. (Wait, did I said that aloud?) When I think of an anthology of battle-poets, I think of all the ways people have used their words as weapons, in powerful and creative ways that have shaped the world. I’m thinking of the pioneers of hip hop. I’m thinking of Sappho writing in exile. I’m thinking of all the people in history whose pen was their sword, and especially people from marginalized genders whose work has been lost or forgotten. My hope is that our anthology can gather up a little bit of that spirit in one place, and have fun with it to boot. Aidan: I’m Aidan Doyle, associate editor of PodCastle, short story writer, and frequent traveler. Like Rachael, I want to see stories of people using their words as weapons – fantastical sonnet-slinging spellbinders and brave bards. Elise: I’m Elise Tobler and I am the senior editor at Shimmer Magazine, cupcake connoisseur, and trebuchet enthusiast. When Aidan proposed the anthology, I was pretty excited over what it could mean and humbled that he thought to invite me. Shimmer has published a few things that would fit my “vision,” but I hope all of our protagonists will be active, curious, and filled with a kind of poetry that overwhelms the reader when they reach the end of the story. 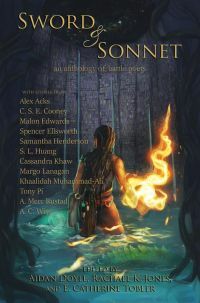 An anthology of battle poets, sonnet slingers, and Haiku-wielding heroines definitely sounds like a concept with a story behind it, possibly one involving shenanigans. How did the idea for this anthology come about? Rachael: I blame Aidan. Picture me standing behind him jabbing both fingers at him. He instigated the shenanigans and press-ganged invited me along for the samurai-stuffed ride. Aidan: I read Sei Shonagon’s The Pillow Book and fell in love with her writing. She was known for intimidating the men of Heian-era Japan with her knowledge of poetry. Fablecroft Publishing announced a call for stories for Cranky Ladies of History and I wrote a story featuring Shonagon using her knowledge of poetry to defeat demons. The story was rejected (a revised version later appeared in PodCastle) but SL Huang remarked that she would love to read a story about a badass battle poet and I had the idea for an anthology of battle poet stories. Elise and Rachael have a lot more editorial experience than I do and I was thrilled they wanted to be involved in the project. Elise: I completely blame Aidan, too, but appreciate his invitation to play on this amazing battlefield. As editors, I know it’s sometimes hard to pin down exactly what you’re looking for in a story, and sometimes the best stories are the ones you never knew you wanted to read until you’ve read them. That said, do you have any particular soft spots in fiction? Are there are any subjects, styles, themes, or anything else you’re hoping to see in the submission pile? Rachael: I’m a complete sucker for stories with a strong sense of voice, and that will be doubly true in an anthology with a poetry motif. I want stories that make me care about the characters and take me into their lives. For a thematic anthology, we’ll also be looking for stories that harmonize and contrast nicely to one another. I am also always on the look out for stories by authors just entering the short fiction world. If you’re looking for your first publication, please submit! Speaking personally, I’m also secretly a huge Old English poetry nerd, and might actually die of joy if I ran across a feminist Beowulf riff somewhere in our submissions. Tyrannosaurs are optional, but always encouraged. Aidan: I have a soft spot for dark humor and for intricate settings. Like most editors I want characters I care about and stories with a strong voice. I also have a weakness for bears. Elise: I love to experiment. I love to jump off a cliff and dare the reader to follow. I hope we see some risk taking! I’ve always found poetry to be powerful. When I’m stuck in my own work, reading poetry can often get my brain back into gear and motion. I am hopeful we’ll see stories that show and explore that power. Poetry can so often be looked down on, but I think it’s just as vital to this world as fiction. Poetry can be quiet, but so can a punch to the gut. whose sword had strange writing upon it. And praised the power of her words. With her sword, her book, and her…hey are those cattle? Bravo! Now, if you yourself were going into battle, what would your weapon of choice be? Rachael: The word Hospitality in sixteen languages, a dappled pink scarf, and my rebellious youth. I would ride behind my battle-poet army on a beat-boxing mastodon and pointedly refuse to smile when asked. It would be terrifying. Aidan: A dancing Christopher Walken riding atop a giant sandworm. Elise: The trebuchet, filled with a thousand thousand volumes of Good Poems for Hard Times, ed. Garrison Keillor. I would follow all of you into battle without hesitation! Any closing thoughts you’d like to share about Sword and Sonnet, or other upcoming projects you’re working on you’d like people to know about? Rachael: While many anthology Kickstarters offer story critiques as a backer reward, ours is offering a special round table-style crit from all three of us. This is a good opportunity to get a peek at the editorial process in a way you almost never get to see when you’re just starting out. We say all the time that editors aren’t a monolith, and different readers can have very different opinions on the same story, which means that often submitting your stories is really a game of finding your ideal reader. Otherwise there’s a tendency to thinking we need to flatten ourselves as writers to fit, to aim for a good generic blandness instead of embracing what makes our voices unique, powerful, and sometimes divisive. But the truth is that every battle poet causes conflict, right? Aidan: We’d love the chance to see what stories writers can create about battle poets and hope that people are excited about the idea as much as we are. Elise: I hope that we have the opportunity to bring you this anthology because the concept is truly unlike anything I’ve seen out there. Thank you all for dropping by! I can’t wait for Sword and Sonnet to be out in the world! Rachael: Thank you so much for having us! Elise: Thanks for having us, Alison. I’m delighted you’re going to be part of this anthology!